We will be doing Letter Rr next week with Grace…which just sorta worked out with RAINBOWS and St. Patrick's day falling during the week. 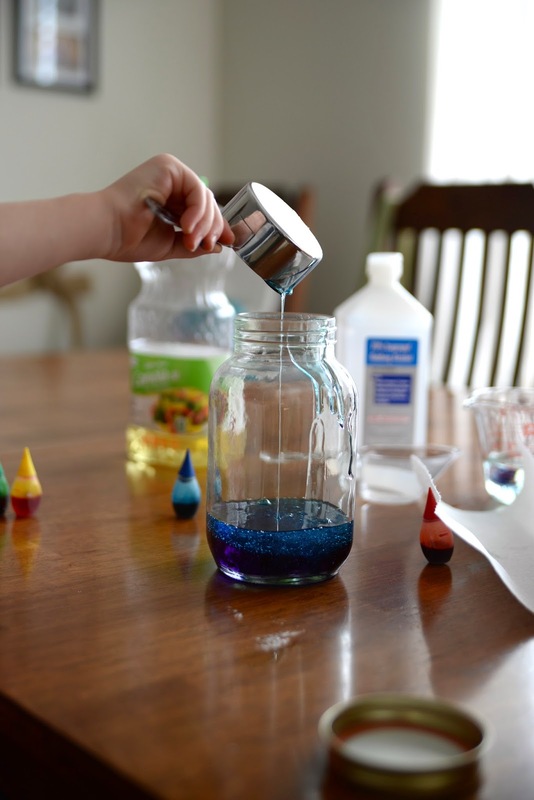 But since we are on spring break this week…I thought we'd go ahead and knock out a couple of fun rainbow-themed activities to help fill up our days. (don't get me wrong…we have watched more episodes of Little House on the Prairie than I'd like to admit…so we are definitely having our lazy days!). I found this idea on Pinterest…but I used the directions found on Sweet and Simple Things for what we did. And one of the best things about this was I had everything on hand. Love it when it works out like that! 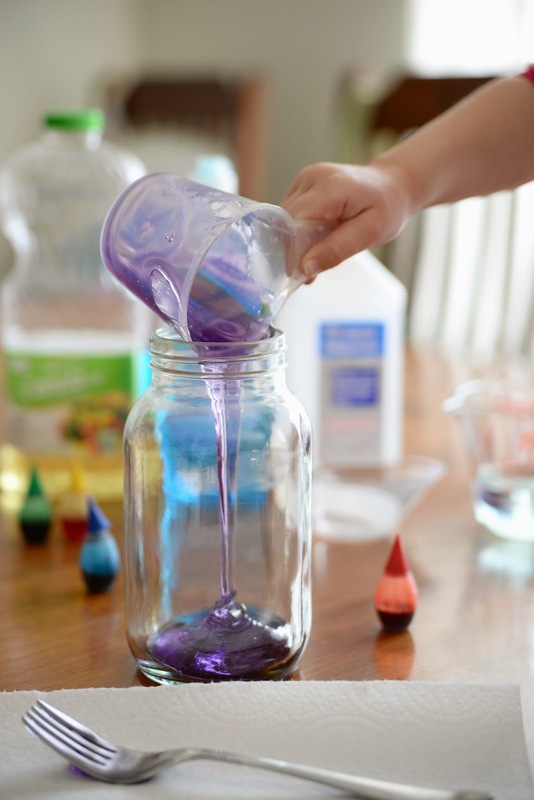 1/2 cup each of light corn syrup, blue dishwashing liquid, water, oil, rubbing alcohol. and a few drops of food coloring. 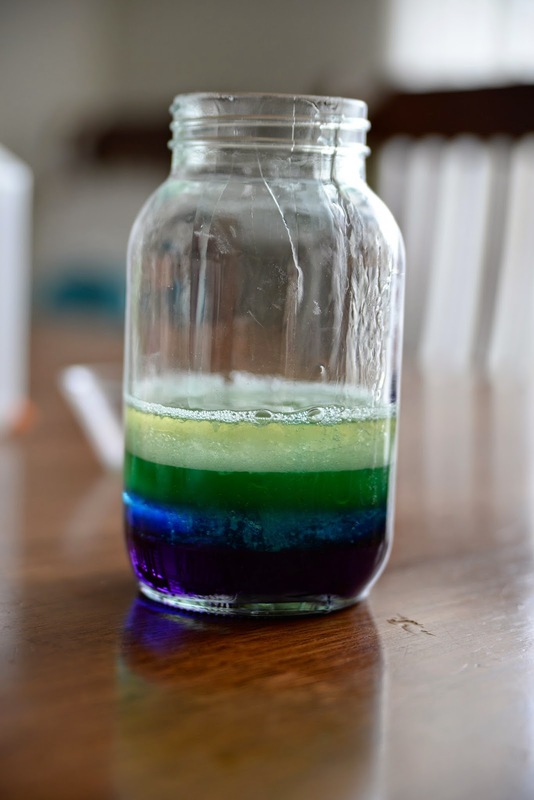 Before we started…I talked a little bit about density and how different liquids have different densities….some have lots of molecules packed tightly together…and others have fewer molecules all spread out. And these differences make some liquids do not mix. So they weren't so into all of that science, which is fine…we had fun! Up first…the light corn syrup and one drop each of red and blue coloring. They took turns mixing it all together. Next up... the dish soap. I did read in some tutorials for this that you should be careful in how you pour it…either not touching the side, or touching the side…or barely tilting it as you pour. Well…we just poured. I wasn't going to stress about it all with them. And guess what…it turned out just find and separated just like it was supposed to after it all settled. Next: water with a few drops of green. The oil was next. The tutorial I used called for Olive Oil…which would have probably made the rainbow better with a more defined 'yellow' color…but I didn't want to use my olive oil. So canola oil it was. And finally…the rubbing alcohol with a few drops of red (we should have put a few more in to make a little more red, but it was fine). I also mentioned how the red food coloring sank right to the bottom…which is not what it did in the water. But it did mix together once we stirred. And there it is…RAINBOW in a jar! To see all the Letter of the Week activities we've done this year... go here. Had seen your FB post on this...you really do amaze me with your innovations on teaching sweet girl! Love the look on the girls' faces!